Oh, how I love spring! This spring I've been loving spending time in the sun, rolling out my mat outside, going for walks, making smoothies, and taking time to slow down and breathe it all in. I'm going to be moving to the north Sacramento valley in a few weeks, to Chico, and I can't wait! This spring especially feels like a fresh start with a lot of new energy. It's been helpful recently to spend time in nature, and to meditate. Find a comfortable seat somewhere at your favorite park. This could be a park bench, or maybe on the grass, with your back up against a tree. Root down through your sit bones and get tall in your spine. Take a few deep breaths, feeling your belly move as you breathe. Close your eyes, and take your awareness inward. Begin to notice the sensations around you. The sunlight, the feeling of the air on your skin. Any sounds nearby. Notice the quality of your thoughts and your emotions, observing them without changing anything. Now, give yourself permission to do nothing. Give yourself free space. No plans. Nothing to accomplish and no one to take care of but yourself. Allow a sense of peace to wash over you. Take as much time here as you like, preferably 5 minutes or more, and when you are ready, transition slowly back into your day. Another wonderful springtime ritual is to clear new space, clean house, and consciously move away from old energy that is no longer serving you. I love that this month's Yogi Surprise box included the perfect products for spring renewal. My favorite is the white sage smudge spray from Molly With Love. This stuff is incredible; you just spritz it whenever you need a pick-me-up or to clear the energy in a room, and boom! Brand new space. Brand new you! What are your favorite springtime rituals? 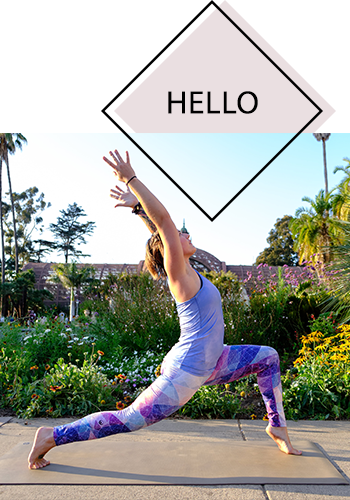 Alive in the Fire is a blog inspired by practicing yoga mindfully, teaching from the heart, giving hugs, and living a badass life. Sign up with your email address to receive news, updates, and exclusive content. Thank you! We are glad you’re part of the Alive in the Fire Community! Copyright 2017. All rights reserved - Alive in the Fire. Design by Hello Big Idea.